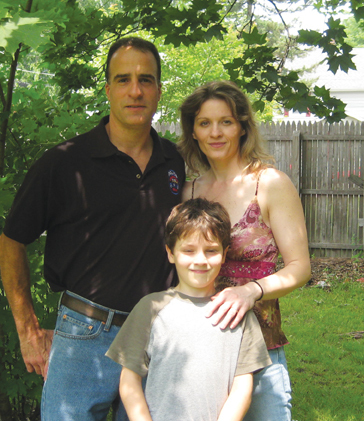 Pete Tetukevich and Ann-Margaret Lyons with their son, Pete Jr.
Ed Note: Today we bring you the final installment of the story of Officers Ann-Margaret Lyons and Pete Tetukevich, who met when they were both assigned to the NYPD’s Emergency Service Unit, the NYPD’s 400-strong SWAT team. These officers are just two of 15 extraordinary cops profiled in pages of Brave Hearts: Extraordinary Stories of Pride, Pain and Courage by American Police Beat publisher Cynthia Brown. Not caught up yet? Read Part I here and Part II here. It was right before Labor Day in 1991. The No. 4 Lexington Avenue train derailed before entering the Union Square Station at 14th Street. On that day, the 4 train was operated by Robert Ray. He derailed switching from the express to the local tracks about one hundred yards before he entered the station. Transit Authority rules require motormen to travel no more than ten miles per hour when switching from one track to another. Ray had been travelling close to fifty. What awaited Ann-Margaret and the other first responders was shocking. The carnage made the station look like a junk yard that had just been bombed. Everything was upside down and burning. The first car of the ten-car train jumped the tracks as it was clearing the switch. It veered to the right slamming into the wall. Then it veered to the left slashing through a dozen metal beams. The car was sheared cleanly in half. The next four cars derailed with the third and fourth cars sustaining the most damage. The force of the crash propelled them up into the air where they collided together with enormous force before they fell back down in a tangled mess. Some of the cars were sticking straight up in a vertical ninety degree angle from the tracks. Five people died and scores were taken to local hospitals with serious injuries. When the doors wouldn’t open on the second car, Ann-Margaret squeezed through a small opening. Once she got inside, she was able to get several more people out of the wreck. By this time the fire department was on the scene. There were bodies lying everywhere and the temperature had soared over one hundred degrees. For her work that day, Lyons received an award for meritorious service. Pete Tetukevich and Ann-Margaret Lyons were both police officers who enjoyed their work serving and protecting the people living, working and visiting New York, no matter the risk. They had yet to meet, but both were developing reputations as gutsy, active cops and their respective bosses were starting to take notice. By 1991 Pete had been transferred to the NYPD’s Emergency Service Unit. He was assigned to Two Truck which covers the neighborhoods of the Upper East Side and Harlem. Among their varied tasks, Emergency Service cops respond to calls when someone is threatening to jump off a bridge or a tall building. On a cold day in December, 1996, Pete and his team were doing their best to keep a distraught man from jumping from his apartment balcony on the seventeenth floor. Saving a jumper is an exercise in finding common ground. It’s an effort to find something the person cares about and get them talking about it. That’s not an easy feat when someone is determined to end their life. If negotiations aren’t working and their instincts tell them the person is going to jump, the officers will try to physically prevent the person from making the leap. It’s called, “going for the grab,” and that’s when it gets dangerous. When they arrived at the distraught man’s apartment, he was out on a narrow ledge off his balcony. Pete remembers him as a well dressed African-American man who looked like he was in his late 20’s. Time was up. Pete was going to grab the man and bring him back up over the balcony where he would be safe. With as little movement and noise as possible, Pete’s team attached a life line to his harness. If the man decided to jump and take Pete with him, the officers would pull him back with the lifeline. Pete’s life was now in their hands. Pete’s fellow officers would have to move fast to pull him back up. The lifeline lived up to its name and the cops came through. They pulled Pete, whose arms were still wrapped around the suicidal man, back up over the railing. As Pete tumbled to the floor and the man fell on top of him, the team moved in quickly. During her career with the NYPD, Ann-Margaret responded to dozens of calls when someone had thrown themselves under an oncoming subway train. “These calls are horrible,” she said. “Body parts are everywhere. A lot of cops throw up the first time they go to one of these scenes. Some people never get used to it. “There was one man who jumped in front of a train at the Queens Plaza stop. He was crushed from the waist down. I had to tell him he was going to die when we got the train off him. It’s so hard to know what to say. I asked him if he wanted a cigarette. I told him we were going to do everything we could for him. It was terrible. Many tasks shouldered by law enforcement officers are emotionally grueling and death notifications are at the top of the list. Most people aren’t aware that along with responding to calls where people die, another difficult task for cops is notifying a family that a loved one is gone. Approximately hundred and sixty law enforcement officers are killed in the line of duty each year. When a police officer dies doing his or her job, the community pays them a dramatic tribute. Hundreds, if not thousands, of law enforcement officers in their dress uniforms attend the funeral to show their respect. For days, details about the slain officer and his or her family are the main feature on local television stations and the newspaper. But there are also thousands of officers who are injured every day. The media rarely shows much interest in these men and women who survive but spend the rest of their lives trying to recover after being shot, stabbed, assaulted, or run over. During his years with the NYPD, Pete Tetukevich was in the hospital so many times he lost count. One injury occurred when he was with Emergency Service on the Apprehension Team, a group of highly trained officers whose mission it is to serve warrants and arrest heavily armed people wanted for serious, mostly violent crimes. One night his team’s assignment was to go to a bodega in Queens and bring in a man wanted for several killings. The doctors stitched him up and Pete was sent home with instructions to keep his leg elevated. The four inch long wound needed to clot and the swelling had to go down before he would be allowed to go back to work. Two days later Pete was bored and he drove to the station. No one wanted to see him back so soon. The swelling was still bad, but the NYPD doctors could see he wanted to get back to work so they ordered him to work the desk for at least two weeks. Fourteen days later, Pete was back on full duty. It took his leg a long time to heal and later he admitted he told the doctors he was feeling better than he really was. He figured his leg would get better sooner or later and he wanted to get back out on the street. Those who knew Pete’s dad, for whom he was named, would not be surprised to hear this story. Pete senior served seventeen years with the NYPD. He spent fifteen of those years working in the Emergency Service Unit. Pete had just turned thirteen when his Dad became ill. The doctors thought he had lung cancer and ordered radiation treatments. But it turned out the diagnosis was wrong and the treatments destroyed his heart. Pete’s father died over thirty years ago but his voice still gets shaky when he talks about him. “My father wanted me to join the Air Force and become a pilot,” Pete remembered. “But I’d spent so much time listening to my dad and his friends talk about being cops, that’s all I wanted to do. They were really great guys and I looked up to them. One thing I admired, even as a little kid, was that they knew how to work hard. On their days off they would work on their own houses, work on their partners’ houses, help each other build new houses. They were always working to make a better life for their friends and families. Eddie was especially eager to talk to Pete about an incident that took place in Washington Heights in the late 1960’s. “There was a call for a man holding a woman hostage,” Pete said. “When the patrol cops showed up he began firing at them with a high powered rifle. They called in Emergency Service and when my Dad and Eddie got on the scene, they could see the rifle pointed right at them through the opening in the door jamb. Bullets were flying so they dove for cover in a corner of the hallway. Eddie wasn’t sure exactly how long they waited before they decided to go in and get the gunman. The day he turned eighteen, Pete signed up for the test. After graduating from high school, Ann-Margaret got a job working in the accounting office of a factory. She says the job was extremely boring. Every hour seemed like six. Despite the fact that law enforcement was still a man’s world and she didn’t know anyone who was a cop, Ann-Margaret signed up for the police test. She was eighteen years old and weighed one hundred and twenty five pounds. She said she never thought about how a woman would survive in the alpha-male culture of the law enforcement. Growing up her friends had all been boys. She preferred climbing trees to playing with dolls and she’d become pretty competitive on the football, softball and soccer fields. When the New York City Police Department called to tell her she was accepted, she quit her job and began the mandatory six months of training in the police academy. Both admit it was not love at first sight, but Pete was curious about the new cop on the team. Once he learned she shared his love of motorcycles and owned a 1993 Harley Davidson Low Rider, he began pestering her to go on a ride. It took several weeks, but she finally agreed. The day of the ride was cold and rainy, but Pete was looking forward to his first date with Ann. Rain or no rain, he didn’t want to cancel. “I decided we’d ride to Connecticut,” Pete said. “We left around ten in the morning and it seemed to be getting colder. When we got over the state line I told Ann I was worried she was getting cold. When I suggested we find a motel and have a hot shower, she looked disgusted.” Pete had to face the fact that Ann was not going to accompany him to a motel on their first date. They ended up in a local pub for lunch instead. People who do marital counseling say there are many things that can be done to improve the situation when couples have sexual problems, conflicts over money, issues with the kids, and different ideas about how to spend leisure time. The situation is harder to fix when partners look at life in totally different ways. Having different world views could be the reason so many law enforcement officers end up divorced when they marry someone who doesn’t understand their job. While Pete and his wife’s differences were making communication hard, Ann wasn’t doing much better. She had been with the same person since high school. Looking back, she says she never should have married him. Everyone expected them to tie the knot and they did, even though she had deep misgivings. The marriage lasted four years. While it may not have been love at first sight, it wasn’t long before Ann-Margaret and Pete realized they were falling in love. A year after their first motorcycle ride, they were both divorced. After their divorces were final, they moved in together. While no one had seen anything in writing, every cop in the NYPD knew the department did not like officers who were married or even dating, to be working together. Ann was determined to keep their relationship a secret. They both had their dream jobs assigned to the Emergency Service Unit, one of the most exciting, prestigious divisions in the entire department . They knew it might be better if they weren’t in the same squad, but it was what it was and they were confident they could deal with it. For a while everything was fine. Pete and Ann-Margaret continued to do great police work and no one paid much attention when they always showed up to work together. “We told them we were carpooling,” Ann said with a grin. As most cops learn, it’s best to eat right when you are about to go on duty. If you wait and it gets busy, chances are good it’ll be eight hours with no time for food. They forced the door open, looked around and walked toward the back bedroom. There wasn’t a sound. They pushed the bedroom door open. There, laying on a queen-size bed, was a naked woman with a two inch stab in her sternum. She was sprawled across the bed and she looked dead. The knife was laying at her side. While Pete was staring at the woman’s stab wound, Ann-Margaret was checking the other rooms. Cops are trained to never assume someone is dead, unless they have absolute proof. She took it for granted Pete would make sure the woman with the knife would not pose a threat. For cops to be distracted like that, to loose their concentration for even just a second, is extremely dangerous. It had never happened to Pete and it made him nervous. One day when Ann and Pete arrived at work, a lieutenant told them he had a problem. A homeless man had built a little shanty town in an open lot in the 28th Precinct in Harlem. In addition to his self-constructed village, over thirty of his dogs were running wild around the neighborhood. The residents were not happy. The night before a group of them had met with the police and demanded something be done. The lieutenant assured them he would look into the matter. Ann and Pete, along with two precinct cops and two lieutenants, loaded up their tranquilizer guns with extra vials of keteset, an anesthetic used to subdue animals. They drove to the lot. The police worked out their plan on the way to the site. They would tranquilize the dogs and once they were down, load them into the truck. When the situation was under control, they would drive the dogs to a shelter. When Ann-Margaret saw the number of dogs they needed to tranquilize, she called for a paddy wagon on her radio. They were going to need a bigger vehicle. Several hours later Pete and Ann had tranquilized close to thirty dogs and moved them into the wagon. There were only a couple left. Pete told Ann he was going to climb up on the sheet metal roof. He thought it would be easier to tranquilize the last few dogs from up there. On Friday, December 8, 1995, Ann-Margaret and Pete were working the day shift. It was a clear, brisk, sunny morning and they had enjoyed their ride into the city. Both recall when they crossed over the George Washington Bridge on their way to the West Side Highway, the Hudson River looked like someone had scattered millions of sparkling diamonds over the top of the water. They parked their Jeep Wrangler and went into the station. The other members of their squad were already there. That day Ann and Pete were teamed up with Henry Medina, Seth Gahr, Pete Conlin and Kevin Flanagan. Kevin Flanagan cooked up some eggs in the small station house kitchen and was making a pot of coffee when Pete and Ann arrived. By the time they got their gear and checked and locked their weapons, it was just after 8:30 a.m. One hour later, they had barely heard the dispatcher’s voice over their police radios. It was eerily quiet, prompting Pete to announce it must be Sunday, not Friday. Sundays in New York City, especially for cops working the day shift, were the quietest time of the week. Little did they know that in less than two hours, they would be dealing with one of the worst crime scenes in New York City’s history. The call came in around 10:15 a.m. “Confirmed robbery in progress, shots fired” and the words all cops dread most, “officer needing assistance.” The location was 272 West 125th Street. It took them only seconds to get suited up. The team donned their Kevlar-reinforced helmets and heavy tactical vests. They went to the large Emergency Service truck where the semi-automatics, sub-machine guns, and high powered rifles are stored. They unlocked the weapons and made sure they had extra rounds. A man armed with a bottle of lighter fluid and a gun, yelling, “It’s on now,” had gone into Freddy’s Fashion Mart, a discount clothing store on Harlem’s bustling 125th Street. Someone called 911 and when two precinct cops showed up, the gunman fired at the officers, pinning one of them down. One officer got away, ran to the street and called in on his radio. Their first task was to make sure the cop who had been pinned down was out of harm’s way. As patrol officers crouched in the doorway with their guns drawn to provide cover, Ann and Pete put their ballistic shields in position and walked towards the gunfire. With bullets whizzing by, they managed to get to the officer and drag him back to safety. Then they took cover. They knew they had to find the back door of the store to make sure the gunman could not escape out the back of building. As they ran towards the rear of the building, they could still hear the crackle of gunfire. Smoke was pouring out of Freddy’s. The whole place looked like it was on fire. They were concerned about getting the shooter but first they had to make sure people in the adjacent buildings knew there was a fire. If necessary, they would help them get out. Ann rushed to the hair salon on one side, and Pete ran through the apartment building on the other, both alerting everyone about the disaster occurring nearby. Once they were sure everyone was safe, Ann and Pete made their way to the rear entrance of the store. By this time scores of police cars and hundreds officers, sergeants, lieutenants, captains and even the police commissioner himself, were on the scene. There were fire trucks and ambulances, reporters and photographers, camera crews and helicopters. Smoke was everywhere. Someone cranked up a boom box with rap music blaring and you could still hear gunfire. No one knew if the people inside Freddy’s were alive or dead. Experienced law enforcement officers agree that at scenes like this, if you get distracted and loose your concentration, you get scared. It’s a vicious cycle with fear leading to confusion which leads to more fear. That’s when the instinct to run from the danger rather than towards it can kick in. It takes enormous discipline and concentration to block everything out except the task at hand. Ann and Pete took stock of the situation. It looked as if the man who had been shot crawled out of a space between the ceiling and a water pipe. But the hole was small and they didn’t think it was big enough for someone to squeeze through. Pete got on his radio, described his position and called for tools, sledgehammers, heavy vests and more powerful weapons. They kept at it. Looking back they both say it could have been seconds, or it could have been hours. They were operating on pure adrenaline. Finally they broke through. Neither Pete nor Ann-Margaret is sure what happened next. The lights had gone out, smoke was everywhere, the heat was soaring and the police were disoriented. Ann was frantically tugging on her vest trying to get it off. Finally it broke free. She made her way over to Pete who was completely enveloped in smoke and still screaming for her to get out. With only their helmets to protect them, Ann and Pete forced their way through the heat and smoke into the store. It was only seconds when Ann came across the first grisly scene. Two young men and two young women were wedged in behind a palette of cinder blocks. They were all dead. As they walked up the stairs to the second floor, the heat was even worse. Gasping for air and making their way through the life-threatening smoke, they found a badly burned man lying on the floor in the middle of one of the aisles. They knew immediately they had their gunman, He was dead. The gun was still in his hand. Still choking, they stepped over his body. By the cash register they could see what looked like a pile of bodies. When they got closer they saw three young girls. The medical examiner determined later they died of smoke inhalation. The man in the basement who was shot five times, was an Irish immigrant who had been doing some construction work at the store. After the contractor was wounded by the gunman, he managed to find an opening around the water pipe in the basement and squeeze himself through. He tried to get the other people in the store to go with him, but no one would follow him. Eventually he recovered from his wounds. He was one of two survivors of the massacre at Freddy’s. It was now early evening. The flames were out but the cops were still hyped up. They needed to find a way to try and get back to normal. Covered with soot and grime from the fire and heartbroken at the tragic loss of life they just witnessed, they went back to the station. By now, Ann-Margaret and Pete were deeply in love. It had been three years since they had met. They loved their work, their divorces were final, they were living together but confident no one knew they were a couple. At that time, any one of their bosses would agree they were two of the toughest, bravest cops on the force. But something changed after their near-death experience at Freddy’s. They began to worry. It was the beginning of the end of their careers in law enforcement. Pete felt it first. “Before Ann and I met, I never thought about dying or even what it would be like if I got seriously hurt. I just focused on the task at hand and took care of business. I started worrying almost from the time I met her and it just grew from there. I realized I met someone I loved and wanted to be with. I thought about her all the time. The biggest surprise for me was I started to enjoy life. Pete would admit later his fears were irrational. If anyone he’d worked with could handle themselves it was Ann. The ambulance arrived within minutes after the collision and Ann-Margaret was rushed to Bellevue Hospital. After going through a round of X-rays, they brought her back to her room. She was only there a few minutes when Pete came barging in. Pete tried to explain. He had cover. Back at the station, when the sergeant asked for someone to volunteer to take Ann-Margaret home from the hospital, Pete said he’d do it. But Ann was still angry. She was alarmed at Pete’s behavior in the hospital room. She knew if anyone heard what he was saying, they’d know they were doing more than carpooling. Pete didn’t care. He was distraught when he learned she was in an accident and he had reason to be nervous. Even in the alpha-male world of ESU, Ann was considered a real go-getter. After his outburst in the hospital room, Pete made a serious effort to keep his worries about Ann at bay. But, it was a losing battle. His behavior on the job became more erratic. He began to face the fact that his lack of focus and inappropriate behavior could jeopardize the lives of his colleagues. That was something he couldn’t live with. He had to decide between the only two things he had ever cared about in his life – his career with the New York City Police Department and Ann-Margaret. They talked all night about the unthinkable, leaving their jobs with the NYPD. The next morning Ann went to work. Her first call was at Ft. Washington Ave and 176th Street. Someone called 911 to complain about an emotionally disturbed person who was throwing things out the window. When Ann and her sergeant arrived at the scene, they could see a man sitting in the window of his apartment with a Rottweiler sitting next to him. Two more officers arrived on the scene and quickly they set up teams. Ann and her partner would corner the snarling, barking dog in the living room while one of the officers would shoot him with his tranquilizer gun. But he missed and the dog went into a bigger rage. Ann had a noose. She decided to rush the dog and try to get it on the dog. As she moved in, the dog bared its teeth, leaped up and attacked her. “The dog went after my hand,” Ann said. “Thank God I had on a thick, leather glove.” As the dog attacked Ann-Margaret, her partner got off a second shot. This time the dart hit the dog. Now Ann could focus on her hand. She looked down and saw blood pouring out of her glove. She waited until she got in the ambulance to remove it. She worried if she took the glove off back in the apartment and the finger fell onto the floor, the dog might be faster and would no doubt enjoy eating her finger. On the way to the hospital she took the glove off and her index finger fell out. She warded off the feelings of nausea, picked up her finger and held it firmly onto the stump on her hand. Trying to hold her finger onto her hand, Ann took her seat in the hospital waiting room. It would be over five hours before a doctor could see her. The X-rays showed the force of the dog’s bite smashed several bones in her hand and the needed to reattach her finger. Henry Medina called Pete to tell him the good news. The doctors said there was a chance Ann would not lose her finger. Four years later, in February, 2002, Pete retired from the job he loved. Ann and Pete now live a one hour drive north of New York City. 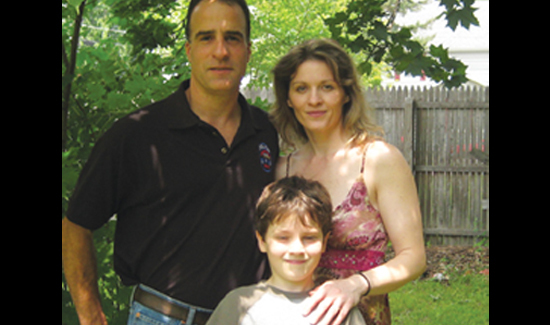 They have a charming house on a tree-lined street, an eight-year-old son, Peter, whom they dote on, and a thriving landscape business they started the week after Pete retired from the NYPD. While they’re not pushing their young son, Pete, into a career in law enforcement, both parents say there are signs he may be headed in that direction.